The Reader feature is interesting, and it shows great room for improvement. You just have to click the "Reader" button up in the address bar (or press ⇧⌘R) to tell Safari to extract text from an article, and it will display it just fine in a modal window that dims the original page. Like this. You can increase and decrease the font size in this window, email the article and print it. These shortcuts are useful. I have the feeling that the Safari team rushed things a little bit though, as there some features which could have been explored deeper and some important inconsistencies that compromise the user experience of Safari itself, not just the Reader. If you open an article (say, this one) the RSS button in the address bar automatically turns into the Reader button. From what I've seen so far, there's no way to get both the buttons on screen at the same time or set up some options to customize the way Reader works. You can imagine that this is quite a problem for users who come to a blog for the first time, perhaps following a link to an article, and don't see the RSS button in the address bar to subscribe to that blog. Also, Reader seems to be working only with "lengthy" articles. I don't know what the exact limit is, but a post like this doesn't work. Update: Turns out you can click and hold to show the RSS button. Why hide such an important feature in this way? Another thing that bugs me is the lack of fullscreen support. 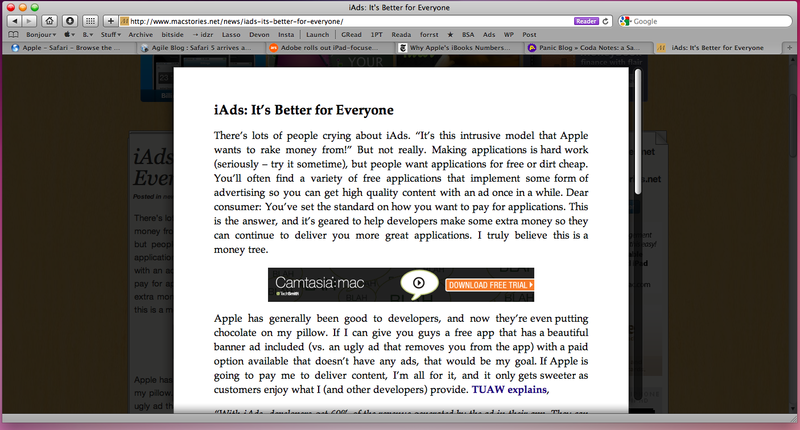 If I want to read an article using an elegant formatted solution, I don't want to see a dimmed background behind it. Sure it helps in removing the clutter, but it's not enough. If Apple really wants to compete with Marco Arment's Instapaper (which is still better from every point of view), they better release some fixes and introduce support for a) fullscreen and b) every kind of article. 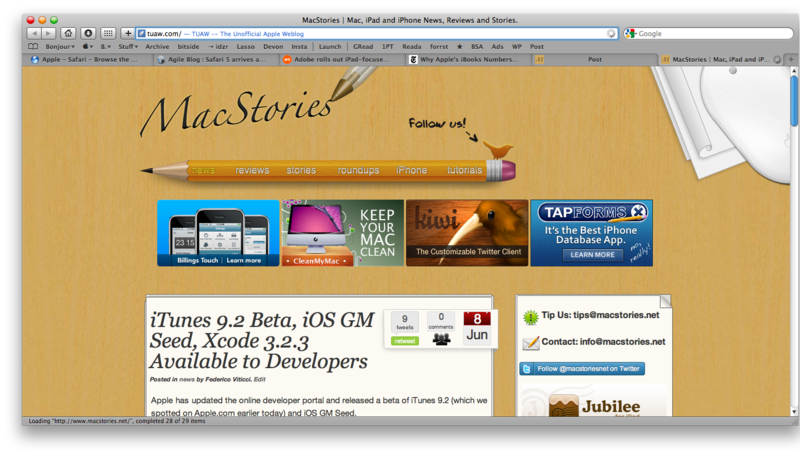 Last, many articles opened with Reader keep showing ads (including MacStories's ones). 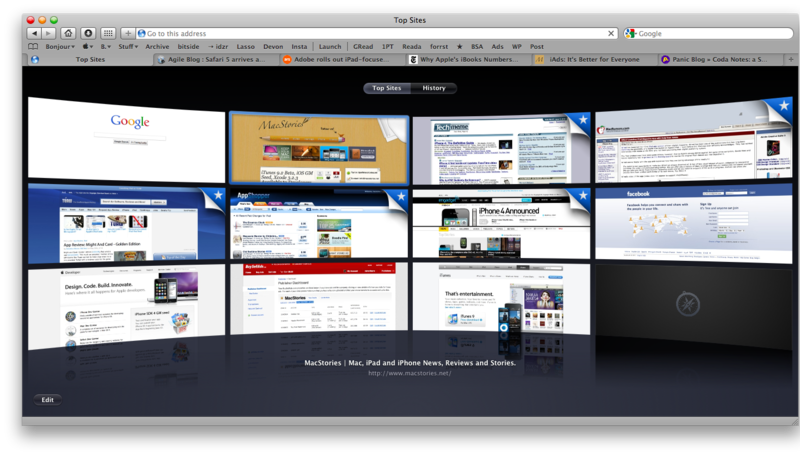 About Top Sites, I'm not a fan of the new glossy buttons. The History integration is very useful. About Bing: not that big of a deal. As for extensions, there's not much to say right now. There are no extensions available yet, but sure the first one that's being developed by Panic looks pretty. If developers will decide to start developing extensions for Safari, and perhaps even sell them for a price - then we should get ready for the rise of a brand new kind of market on the Mac. Which should come soon to iOS platform as well, and that will be a huge deal. The Safari 5 feature I love most is probably one of those average users won't really notice. When you try to open a link that's in your History, the title of that page (and not just the URL) will appear in the Address Bar. For me, it's a very welcomed feature. Safari 5 sets the bar very high in terms of browser rendering, tries to introduce a couple of new features and gives us a glimpse at a new market coming on Mac OS X. I think that's a quite an achievement for Apple. Check out our Safari 5 photo set on Flickr.